Gingerbread houses: the baking, the building, the decorating. Ordinarily I'd say, what's not to love? The thing is, there is something not to love, and that's the gingerbread. Frankly, I'm not all that fond of the sturdy (ahem) gingerbread that's typically used in gingerbread houses. 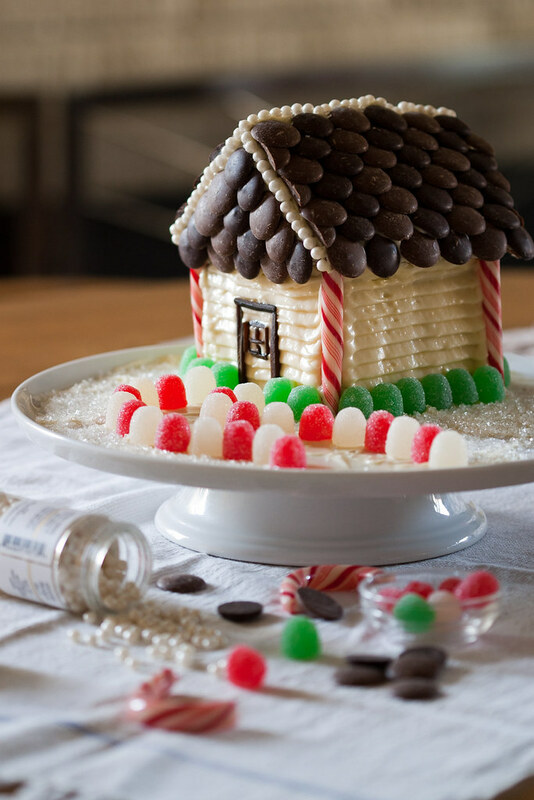 Perhaps some people are content with the only fun part being the decorating, and perhaps some people actually like the traditional gingerbread, but I'm not one of those people--I want to play with my food, but I also want to eat it. Fortunately there's a different way. If you ask me, it's a better way. Years ago I happened on a Martha Stewart gingerbread house recipe that used not the hard, unappetizing type of gingerbread, but gingerbread cake. I can't for the life of me find the recipe, and I don't even remember if the cake was anything special. The key thing was the concept. 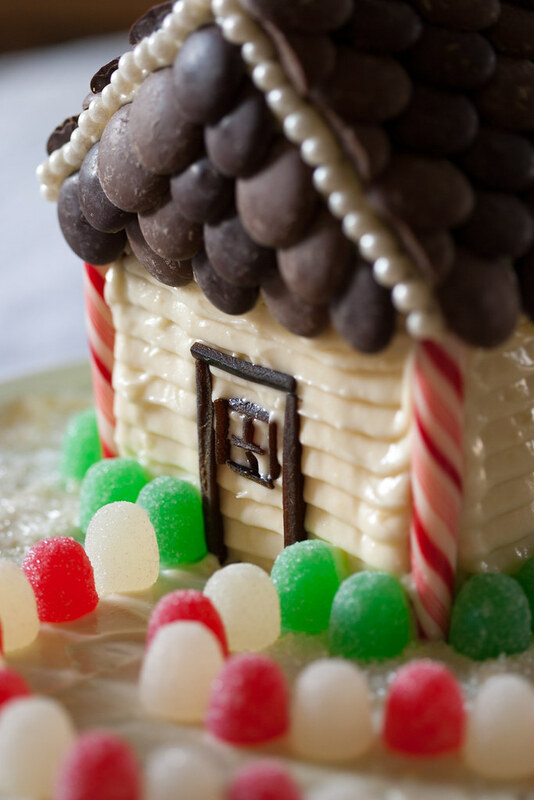 If you make a gingerbread house using cake, your problem will be keeping yourself from eating all your construction materials before you even start building, rather than the guilt over throwing out something you baked but can't bring yourself to eat. This cake is a ginger-lover's cake. Indeed, with two tablespoons (!!) 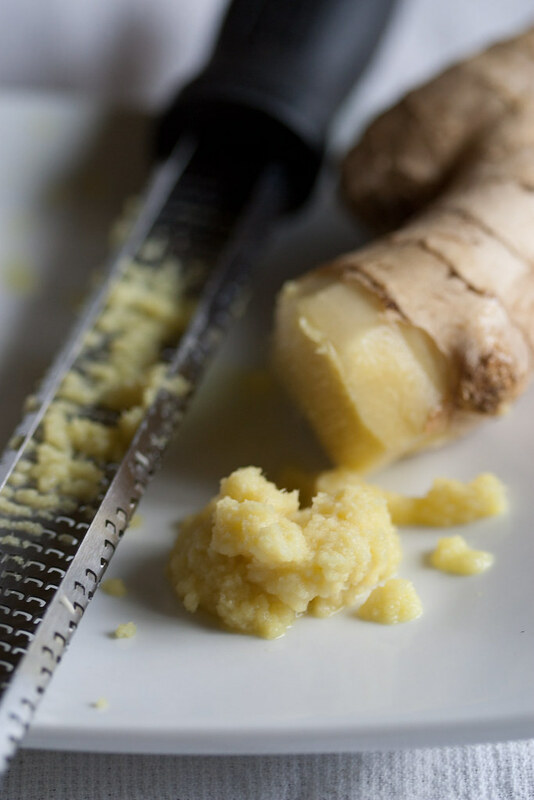 of ground ginger and a tablespoon of fresh ginger, it might even be too strong for people whose feelings toward ginger don't rise to the level of fervent admiration. Again, I'm not one of those people. I've tried other gingerbread cakes before, ones that gave a cursory nod to the ginger flavor but ultimately left me wanting more. Not this one. 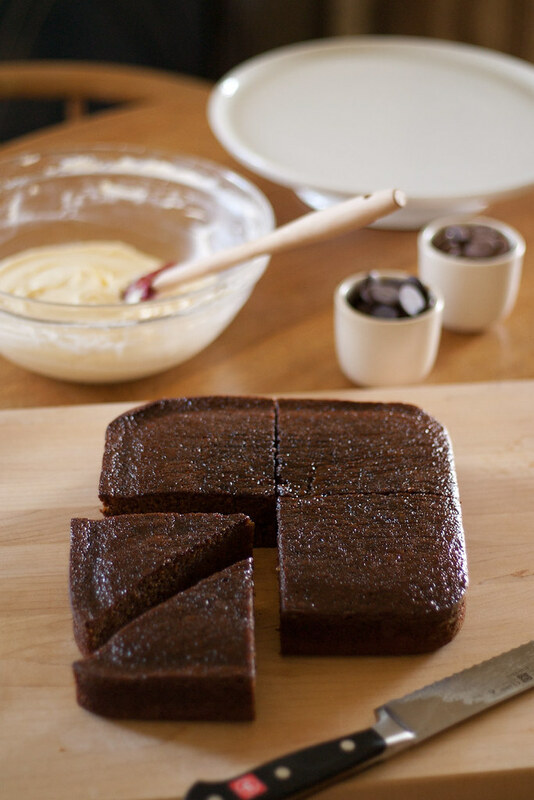 Here the warm, spicy ginger flavor comes through beautifully against the hearty, stout-enriched cake. I enjoyed building and decorating my little house, but for once I think I might have even more fun eating it. Place an oven rack in the middle position, and preheat the oven to 350 degrees. Oil an 8-inch square baking pan (preferably glass or ceramic, see note), dust it with flour, and set aside. Place the stout in a medium saucepan (at least 1 1/2 quarts, trust me) over medium heat. 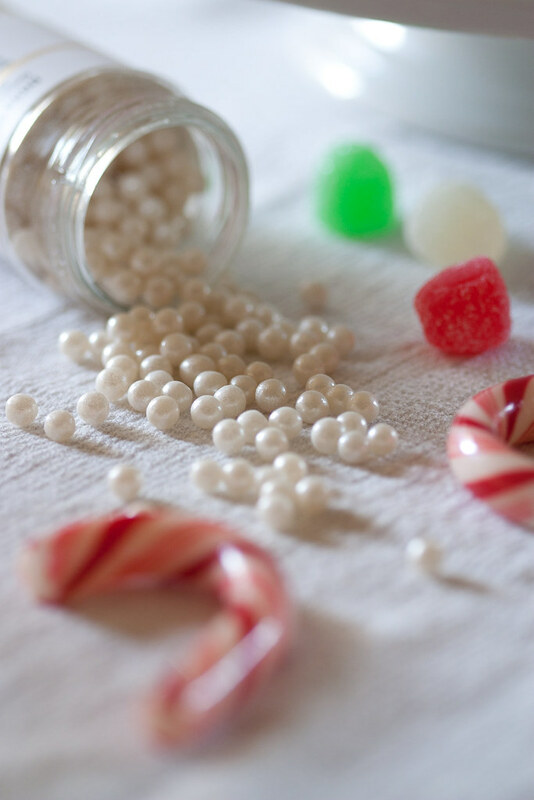 When it comes to a boil, remove it from the heat and stir in the baking soda. Don't be alarmed when it produces a copious amount of foam. Let the foam subside, then stir in the molasses and sugars until they're dissolved. 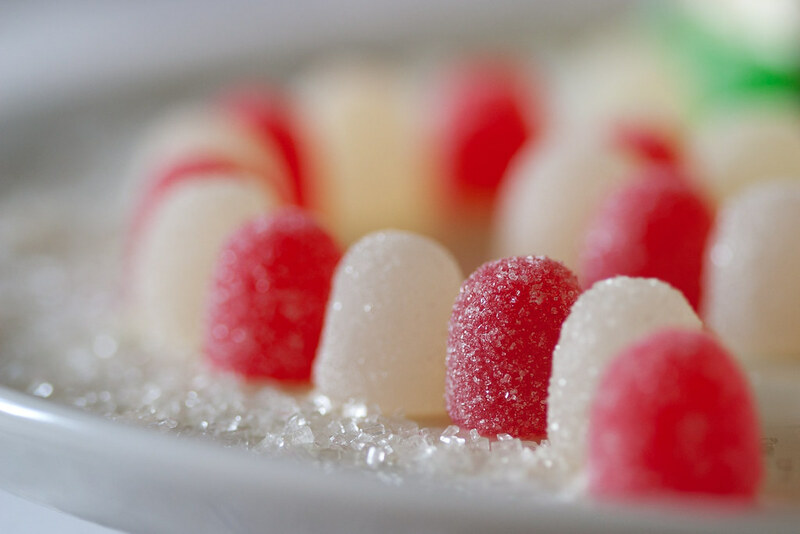 Set the mixture aside and let cool slightly while you prepare the dry ingredients. 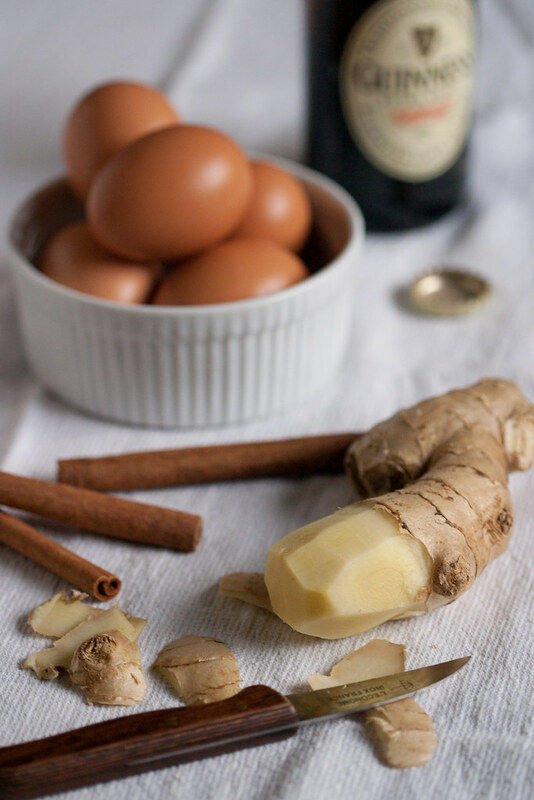 In a medium bowl, whisk together the flour, ground ginger (not fresh), baking powder, salt, cinnamon, and pepper. Set aside. When the stout mixture has cooled somewhat (should be warm to the touch, but not hot), whisk in the eggs, oil, and fresh ginger. Add the wet ingredients to the dry ingredients in three parts, whisking vigorously (yes, really) after each addition. The batter should be completely smooth before you proceed with subsequent additions. Pour the batter into the prepared pan, and tap the pan against the counter (gently!) in order to release any large air bubbles in the batter. Bake for 35-45 minutes, or until a toothpick inserted into the center of the cake comes out clean, and the top is just firm to touch. Be patient--unless you know that your oven tends to rush things (or the cake appears to be burning), try not to open the oven door until at least 35 minutes have passed. Cool the cake in the pan on a rack for at least 1 1/2 hours, and serve either warm or at room temperature. If you only have a thin-walled (metal) pan, the folks at Cook's Illustrated recommend using cake strips to insulate the cake and prevent the edges from burning. The cake can be stored, wrapped tightly in plastic and kept at room temperature, for two days. The original recipe recommends serving it with whipped cream, but for construction purposes I recommend something more substantial, like cream cheese frosting. Cream cheese frosting is simply two parts cream cheese, one part butter, plus vanilla extract and powdered sugar to taste--1/2 teaspoon vanilla and 1 cup powdered sugar are a good starting point for 8 ounces of cream cheese.